M.C. Baker has lived most of his life in rural South Eastern Australia, being born in the north eastern region and now semi retired in the lovely climate of the northern plains. Much of his working life has been spent talking to customers on the other side of a counter selling them books and newspapers and more recently the other side of a bar. All those years have not been wasted however and his keen eye has filled his mind with plenty of characters and stories to fill the many books he will write in his newly acquired spare time.. It will surprise many, but not as many as he thinks, when those who know him as the voice of their town and region on the radio during happy and sad times reveals his story telling talents in this his first novel. This fast paced story of a mild mannered Aussie widow who has spent the last year mourning the loss of the love of his life, his wife Marlene, decides it’s time to honour the promise he made to her to get out there and meet new people, by taking a trip to Tyler in the US to visit his son and daughter-in-law. His life takes an interesting turn before he even boards the plane and is more action packed after he arrives. The humble, unassuming Aussie becomes an accidental hero and re-discovers his zest for life. This book has had me laughing aloud, and at times, almost crying. And I absolutely love the Aussie humour dotted throughout the book. Dennis Brownfield is a loveable character and I have enjoyed getting to know him. I hope to read more from you, M C Baker. 5.0 out of 5 starsMust read !! Loved this book!! The storyline is an easy to follow, easy to read story of Dennis who is just an average guy, who travels and finds a whole new meaning to his life while maintaining his levelheaded ways. The author has created a story of adventure, fun and also has an heroic streak added to it. Wonderful read !! 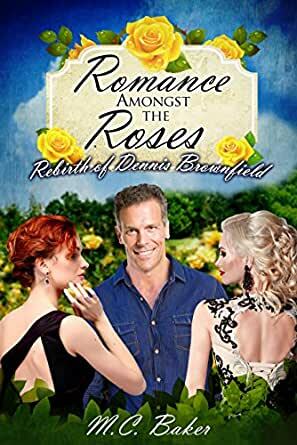 Romance Amongst the Roses: The Rebirth of Dennis Brownfield is an easy-going tale of Dennis Brownfield, a middle-aged Aussie widower visiting his son and family in North America, Texas to be exact. Right from the get-go, Dennis is in for a fun-filled adventure when he meet Dolly Parton impersonator, Gloria, at the airport. Chance is on Dennis' side throughout his holiday, with happy and sometimes daring coincidences at every turn, helping him to move on from his wife's death, while keeping her close to his heart. A fun, easy book to read if you have some spare time and need to escape from the real world. What a beautiful love story about a man who lost his wife and the,love of his life. He has been down and just in a rut until he comes to visit his son in Tyler, TX. What Mr. Baker wrote about Tyler is so true. I have lived in Tyler for over 60 years and the Tyler Rose Festival is a big deal here. I know he changed the names of the people, but the restaurants, Lake Fork, Faulkner Park and the University are real. This is a fast paced story covering a four week trip. It is a great story and you will enjoy reading, laughing and crying when you read is book. M.C Baker has done an outstanding job with Romance Amongst The Roses: The Rebirth of Dennis Brownfield. A story of finding the will to move on with his live after the devastating loss of his beloved wife Marlene. Follow Dennis on a month long trip from Australia to the states where he goes to visit his son and daughter in law. The adventure all begins on the departing flight and just gets better from there. The people he meets, the friends that he makes, the hero that he becomes and more. I laughed, I cried, I smiled and cried some more. M.C's writing and the way that he tells the story and the characters involved will have you glued to the book and not wanting to put it down. I can't wait to bury myself in what I believe is "A work of art". This is a book that I would consider a true romance. Romance amongst the roses by MC Baker is a wonderful story about a man that is stuck in a rut after his wife’s death. After a year, he finally makes the journey from Australia to Texas to visit his son. Throughout the entire trip, MC Baker has Dennis Brownfield encounter many different female characters, all of which he develops a unique relationship with. I was smiling most of the book, had some laughs, but there were a few heartfelt tender moments that had me teary. Would definitely recommend this book to anyone looking to read a great romance. This story is beautiful and heart felt, sweet and genuine. The characters are lovable and definitely show the diversity of the human psyche. I did find parts drawn out, and it took awhile for the story to get going (though this did build the characters personalities) but overall a sweet long read about moving on in life. As I start every review, I will not tell you the story. Why you ask, it's because I want you to read it like I did. By only knowing that it's a book about a 50ish year old widower who embarks on a trip from Australia to America to visit family. And now I can tell you that I enjoyed every page that led Dennis to experience friendship, excitement, bravery, sadness, joy and an overwhelming sense of romantic sexual intimacy when he thought it could never be again. Romance lives at any age.